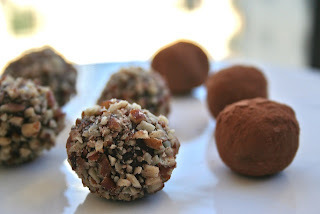 Dalia's Kitchen: Festive Truffles.. Merry Christmas! This is the best part of the entire year.. It's all about food, love, and looking back at the year wishing that the best of the one that has past is the worst of the year to come.. Of course, as I'm sipping a beautiful glass of mulled wine I'm getting a little emotional, thinking back at everything this year had to offer.. And as the household and my taste buds are preparing for my mom in law Ronnie's beautiful Christmas lunch tomorrow, I would like to wish everyone a very Merry Christmas.. Melt the chocolate in a double boiler, add the instant coffee and let it cool a little.. Add the heavy cream, cream cheese and almond extract, then mix until smooth and thick.. Let it cool in the fridge for an hour or until chilled..